We are very excited to announce the Peggy and Jack Baskin Foundation Presidential Chair for Feminist Studies at UC Santa Cruz.This endowed chair was recently established with a $500,000 gift from the Peggy and Jack Baskin Foundation and matching funds from the UC Regents. The endowed chair will help fund research and teaching as well as graduate fellowships in Feminist Studies. Questions? Contact Jessica Guild at (831) 459-1274 or jguild@ucsc.edu. The Peggy and Jack Baskin Foundation currently focuses on improving the lives of women and girls and ensuring equal access to education for all community members. UC Santa Cruz and the Peggy and Jack Baskin Foundation have been partnering on advancing innovative and impactful scholarship for many years. The foundation has funded the Baskin Feminist Scholars Program and the Baskin Scholars Program in Engineering that enable community college students to transfer to UC Santa Cruz, underwritten fellowships to women doctoral students in engineering, offered scholarships to women transfer students, and funded the summer Girls in Engineering program for middle-school girls since its inception. 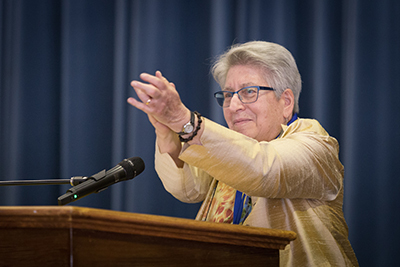 With this new Presidential Chair, the Peggy and Jack Baskin Foundation is leading the way in support of teaching and research in feminist studies at UC Santa Cruz.